1. Must have completed Bachelor Degree from any recognized University/Institute. 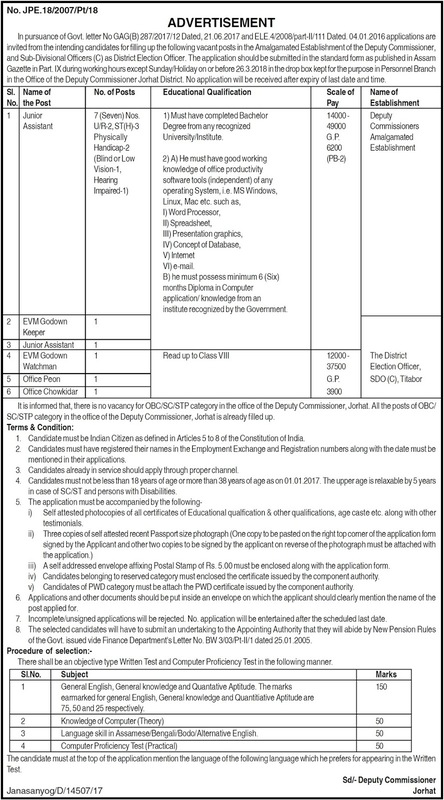 It is informed that, there is no vacancy for OBC/SC/STP category in the office of the Deputy Commissioner, Jorhat. All the posts of OBC/ SC/STP category in the office of the Deputy Commissioner, Jorhat is already filled up. Candidates must have registered their names in the Employment Exchange and Registration numbers along with the date must be mentioned in their applications. i) Self attested photocopies of all certificates of Educational qualfication & other qualifications, age caste etc. along with other testimonials. iii) A self addressed envelope affixing Postal Stamp of Rs. 5.00 must be enclosed along with the application form. iv) Candidates belonging to reserved category must enclosed the certificate issued by the component authority. v) Candidates of PWD category must be attach the PWD certificate issued by the component authority.